IMPORTANT: THIS PROJECT IS ONLY SUITABLE FOR BATTERY-OPERATED TEALIGHTS. 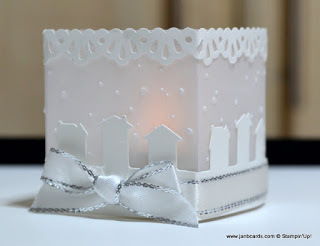 tealight lantern I shared with you on Friday. wasn’t happy with about Friday’s lantern which I amended for the video. 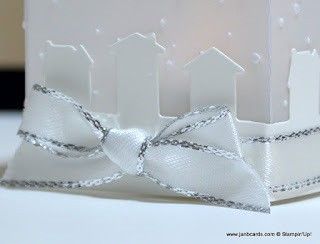 Whisper White Cardstock is visible instead of the lid – so much nicer. previously made something similar, decorated with butterflies. These would also make beautiful table decorations for a wedding or as wedding favours with sweet treets instead of the battery-operated tealight! There are so many possibilities. Enjoy! PLEASE REMEMBER: THIS PROJECT IS ONLY SUITABLE FOR BATTERY-OPERATED TEALIGHTS. 23:50 (CET) /10:50 p.m. (GMT). Rack and the new Blend Pens! Finally, today is the last day for the Online Extravaganza! I wish you all a happy Sunday, and until tomorrow, happy crafting. « Eclipse with a Twist?